If there is one woman putting Asheville, North Carolina on the food map, it's Chef Katie Button. Recently nominated for a James Beard Award for Best Chef Southeast, Katie perfects her craft as the co-owner of Cúrate and Button & Co. Bagels. She is also part of the planning committee for the Chow Chow Culinary Festival, which will debut in September 2019. Button got her start in Spain while serving at Ferran Adriá's El Bulli restaurant. She wasn't classically trained but had an unwavering passion for food. When she told her managers she wanted to work in the kitchen they told her to get more experience. So she did. Fast forward to today and Asheville Chef Katie Button now runs one of the most popular restaurants in the city. It's always a must to book a reservation at Cúrate when you find yourself in the city, especially for a special occasion. The restaurant focuses on authentic Spanish tapas paired with Spanish wine and cocktails. My boyfriend and I have been twice in the past year and we always walk away trying to figure out how Katie makes her food so darn delicious. I found the answer when I was walking around my local bookstore and saw her cookbook on the shelf. It had all of our favorites in it (two words: sherry mushrooms). I slapped it on the counter and gleefully dreamed of all the food I would be enjoying as the cashier rang me up. 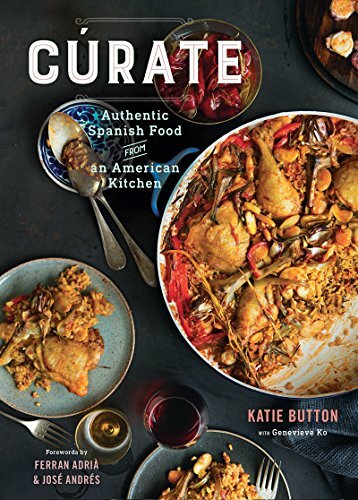 Featuring 125 recipes, Cúrate: Authentic Spanish Food from an American Kitchen is the perfect cookbook for every kitchen. From traditional recipes, like the Tortilla Española to celebratory drinks, the Cúrate cookbook begs for a full-fledged dinner party. The definition of a dinner party is up to you-in this case, it was just for two. My boyfriend and I decided on three recipes: Pan con Tomate, Tortilla Española, and Setas al Jerez which translated to tomato toast, Spanish tortilla and mushrooms sauteed in sherry. We also planned to prepare stuffed piquillo peppers however after some phone calls to local grocery stores we were unable to find the roasted peppers. If you plan on making them I suggest buying them online. This dish is so simple to make and is such a great way to use fresh tomatoes from the garden. With five ingredients and short cooking time, this tomato and toast tapa is a great start to any Spanish meal. Find the recipe on page 22. The last time I made a Spanish Tortilla was in Culinary school during my Mediterranean cuisine class. I dropped the entire dish when I tried to flip it onto a plate. Thankfully my boyfriend has much more upper body strength than me and was able to flip the tortilla in the cast iron skillet. We added in chopped sweet peppers to add a little bit of bite. This dish is best served at room temperature, so make sure you cook it ahead of time. Find the recipe on page 25. If there is one dish you have to try while at Cúrate, it's the sherry mushrooms. I was so excited to see this recipe in the book and it tastes exactly like the restaurant version. The secret is a porcini mushroom broth that adds a beautiful earthiness to the dish. Find the recipe on page 176. I'm already itching to try out some of her other recipes including a watermelon tomato salad with goat cheese and corn nuts. According to Katie, it is best to wait until the peak of tomato and watermelon season to enjoy this fresh salad. Until then I'll just have to cook my way through the rest of her cookbook.